2013 - Relax A Little; One Of Your Most Celebrated Nervous Tics Will Be Your Undoing, Narwhal Projects, Toronto. Curated by: Kristin Weckworth and Jon Davies. 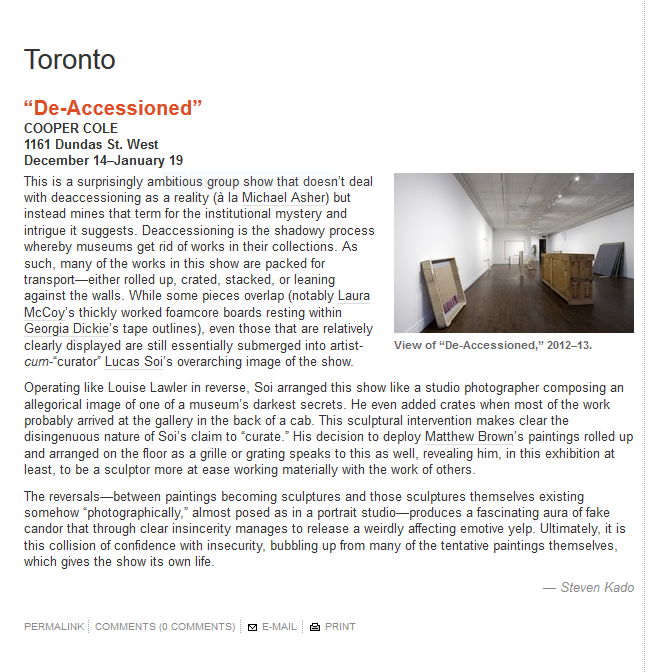 2012 - De-Accessioned, Cooper Cole , Toronto. Curated by: Lucas Soi. 2011 - Unreal, Vancouver Art Gallery, Vancouver, BC. Curated by: Daina Augaitus. 2010 - Pulp Fiction, Saint Mary's University Art Gallery Curated by: Corinna Ghaznavi. 2009 - The Unreal, With Jason Mclean and Rebecca Brewer, Vancouver. Curated by: Emmy Lee and Stephanie Rebick. 2009 - And They Flew, Clint Roenisch Gallery, Toronto, ON. 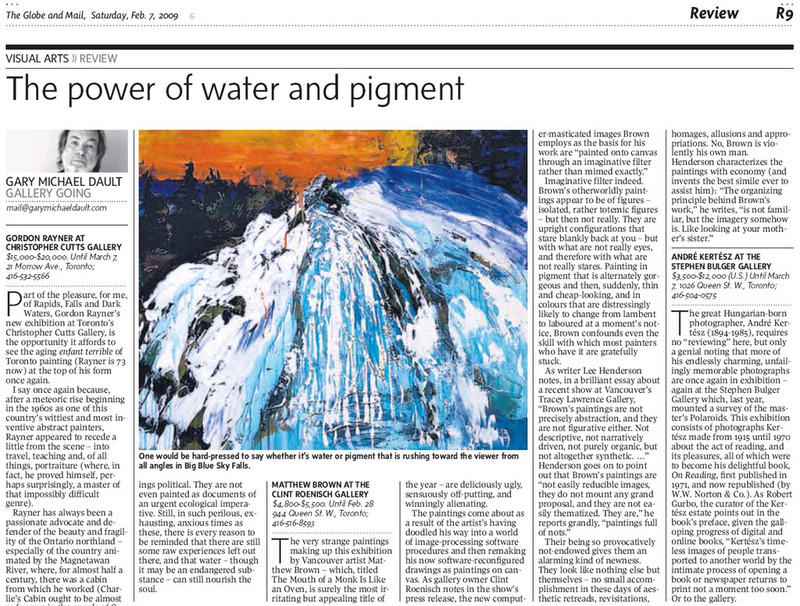 2009 - Pulp Fiction, MOCCA, Toronto; Museum London; Mount St. Vincent University Gallery, Halifax, Toronto, London, Halifax. Curated by: Corinna Ghaznavi. 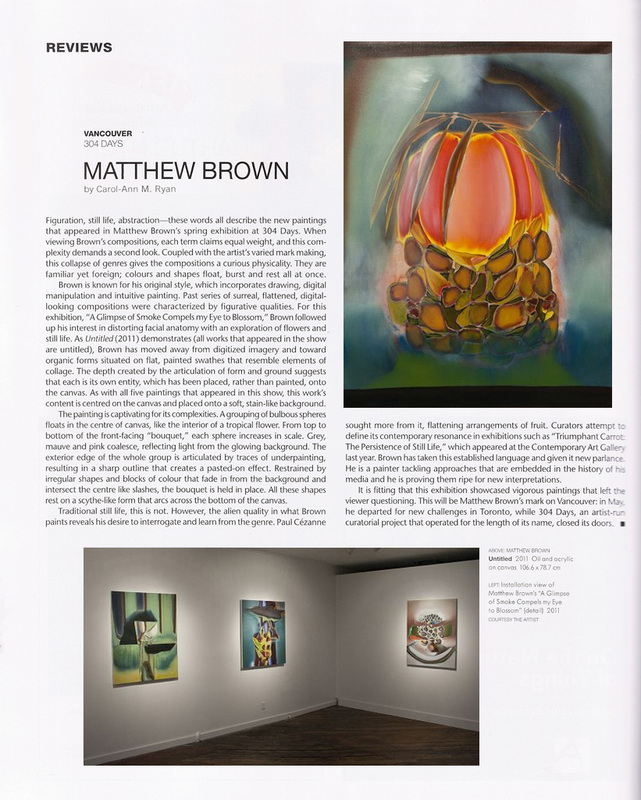 2009 - The Phoenix Art: The Renewed Life of Contemporary Painting, Galerie Simon Blais, Montreal, QC. Curated by: Robert Enright. 2009 - This Zodiac of Lights, This Tent of Dropping Clouds, Clint Roenisch Gallery, Toronto. 2008 - CBV2, Museum Of Contemporary Canadian Art, Toronto, ON. Curated by: Clint Roenisch and David Liss. 2008 - KIOSK XXII, Artists Space, NY; Galerie Art And Essai, Rennes France; Midway Contemporary, Minneapolis, USA;, Rennes, France. Curated by: Christoph Keller. 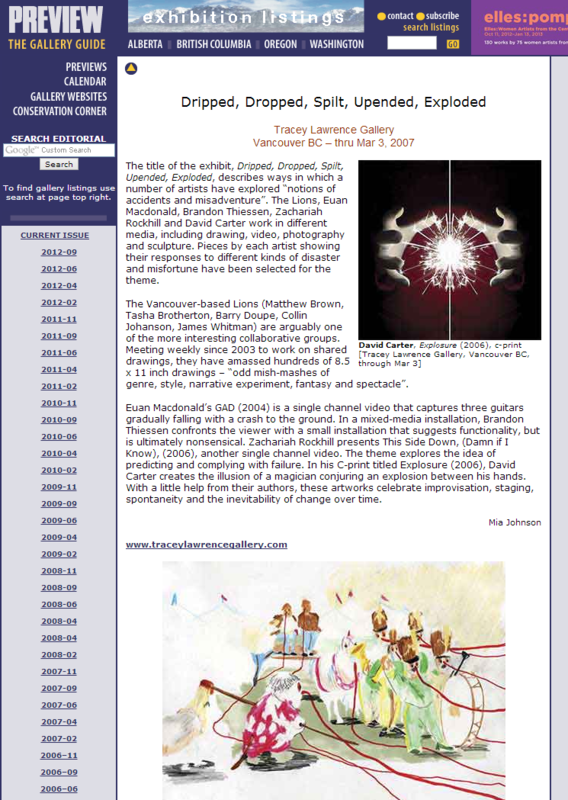 2008 - The Lions – Group Exhib In Stockholm, Sweden, , Stockholm, Sweden. Curated by: Tony Cederteg, Jeanette Steinsland, and Jacob Berliner..
2007 - 2X4, Tracey Lawrence Gallery, Vancouver, BC. 2007 - Dripped, Dropped, Split, Upended, Exploded, Tracey Lawrence Gallery, Vancouver. Curated by: Chris Keatley. 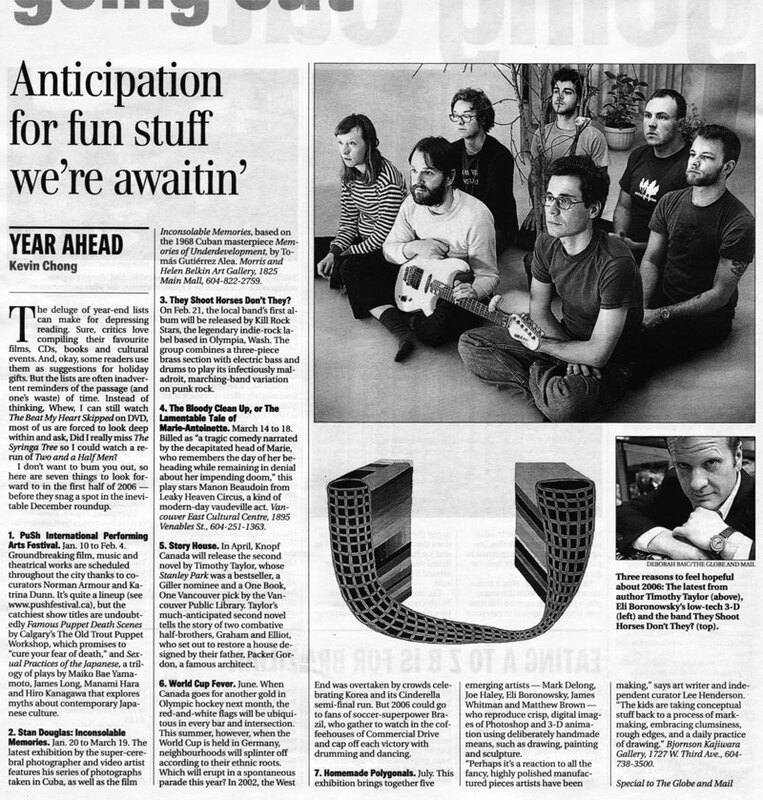 2007 - Tinyvices.Com, Univ. Of Wisconsin, Oshkosh; Studio Bee, Tokyo; The Gallery Soho, Clair De Roven Books, London, UK; Proyectos/Monclova, Mexico City; White Flag Projects, St. Louis, MO;, London, UK. Curated by: Tim Barber. 2006 - Sis-Eht (MFA Thesis Exhibition), Bourget Gallery, Montreal. 2006 - A Summer Group Show, Marlborough Gallery, New York, USA. 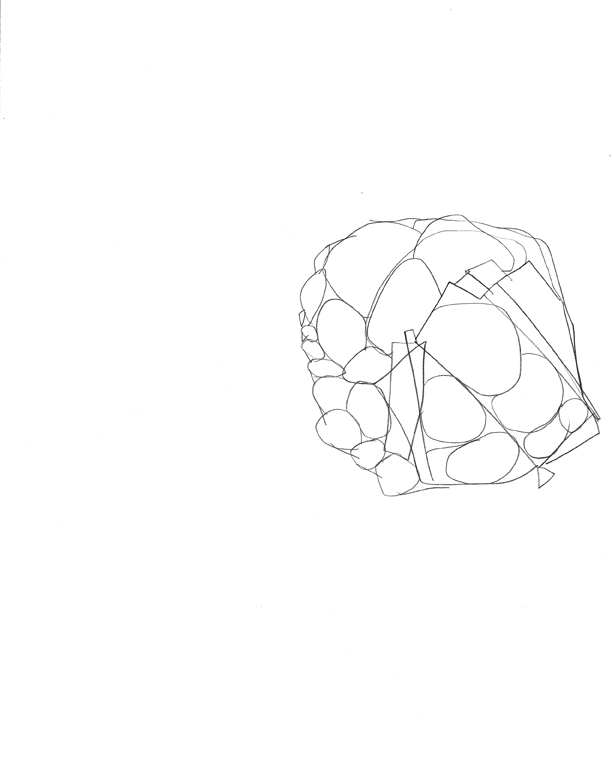 2006 - Homemade Polygons, Bjornson Kajiwara Gallery, Vancouver, BC. Curated by: Lee Henderson. 2006 - Extensions Of Our Hands, Khyber Arts Centre, Halifax, NS. 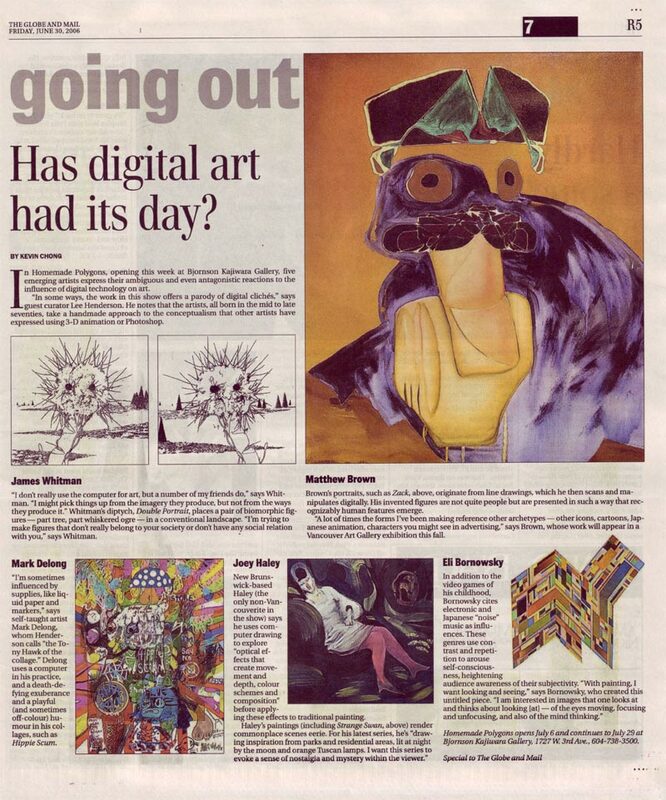 2006 - RBC Painting Competition, MOCCA, Toronto; Contemporain De Musee D'art, Montreal; Contemporary Art Gallery, Vancouver; Kitchener-Waterloo Art Gallery; Art Gallery Of Calgary, Toronto, Canada. 2006 - Book Forms, Emily Carr Institute, Vancouver, BC. Curated by: Owen Plummer. 2006 - Abstractions And Distractions, Patrick Mikhail Gallery, Ottawa. 2005 - Strange Bedfellows, Truck Gallery, Calgary, Canada. Curated by: Holly Simon. 2005 - RBC Painting Competition, St. Mary's, Halifax; MOCCA, Toronto; Bau-Xi, Vancouver; Galerie Sussex Gallery, Ottawa, Halifax. 2005 - Projet MOBILIVRE-BOOKMOBILE Project, , Worldwide. 2005 - Cyclop’s Dreams, Access Artist Run Centre, Vancouver, BC. 2005 - PAINT, Vancouver Art Gallery, Vancouver, BC. Curated by: Curated by Neil Campbell and Monika Szewczyk..
2003 - Birthdaycake Island, Access Artist Run Centre, Vancouver, BC. 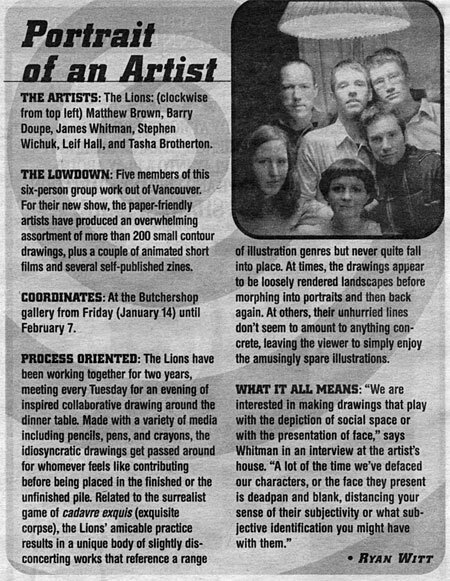 2002 - Vancouver Artists, Neutral Ground Gallery, Regina; Fifth Parallel Gallery, Regina, Regina. 2002 - Faux Telephone Pole, 536 Site Space, Vancouver, BC. 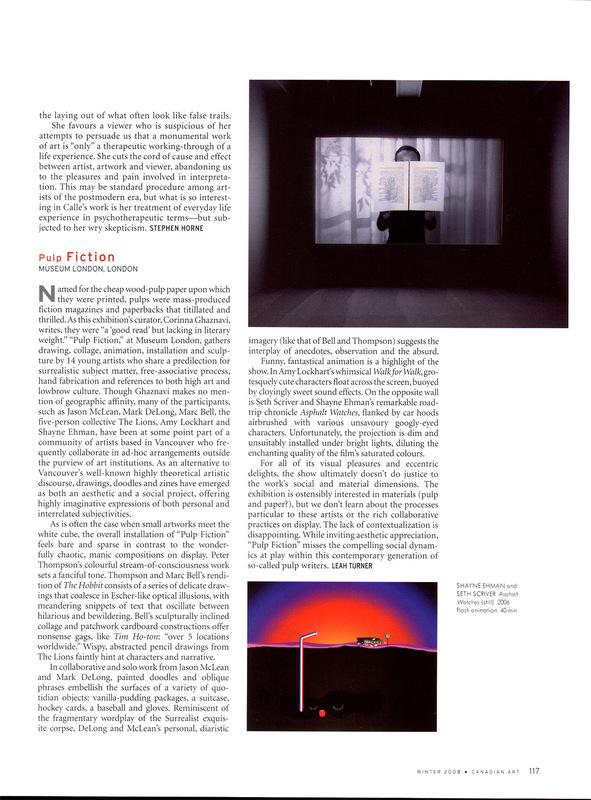 2008 - Food For Thought, VLM, Exhibition Overview, VLM Magazine, Vancouver. 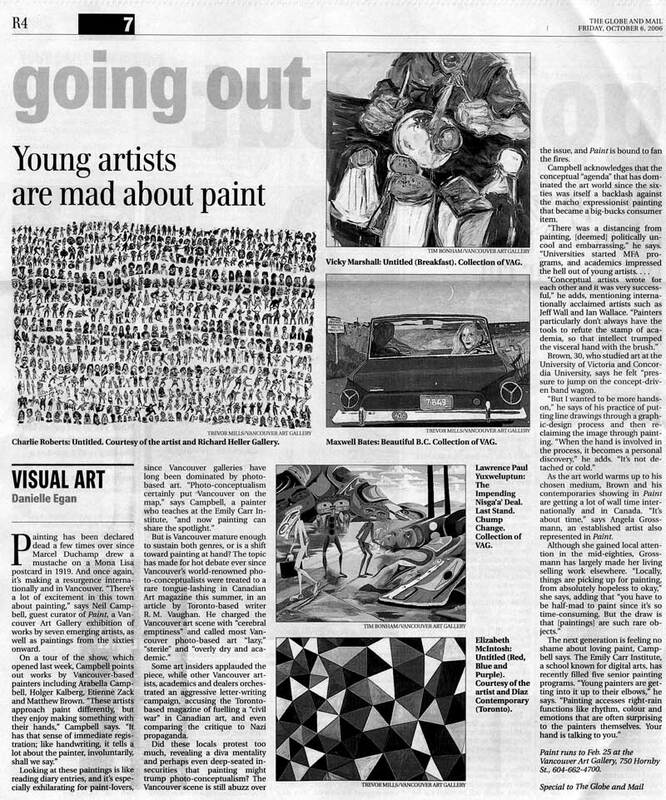 2006 - Painting Competition Means Exposure For Emerging Artists, CBC Arts, Article On RBC Painting Competition. 2010 - Toronto International Art Fair, Courtesy of Clint Roenisch Gallery, Toronto, ON. 2009 - Toronto International Art Fair 2009, , Toronto, ON. 2007 - Aqua Art 2007, Courtesy Of Tracey Lawrence Gallery, Vancouver, Miami. 2007 - Duesseldorf Contemporary 2007 Art Fair, Courtesy Of Tracey Lawrence Gallery, Vancouver, Germany. 2006 - Toronto International Art Fair, Courtesy of Bjornson Kajiwara Gallery. With, Toronto, Canada. 2010 - The Lions Donate to The Fine Line Fundraiser, Movember Auction, Toronto, ON. 2010 - Birds of a Feather Gala, Border Crossings Magazine, Winnipeg, MB. 2009 - Aexcess Auction – Friday, February 13, 2009, Access Gallery, Vancouver, BC. 2009 - C Magazine Auction 2009: Spring Fling 5, Birch Libralato, Toronto. 2008 - C Magazine Auction: SPRING FLING 4!, Birch Libralato Gallery, Toronto, ON. 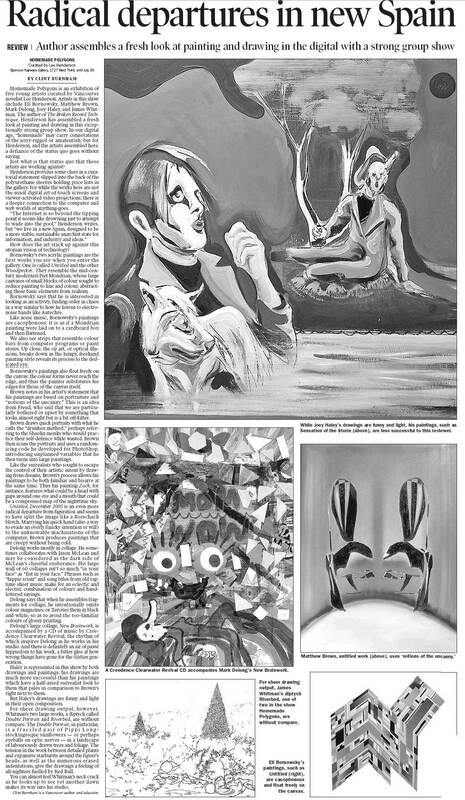 2008 - Paradise: Lost And Found, Border Crossings Magazine, Winnipeg, MB. 2008 - 35th Anniversary Gala Dinner And Art Auction, Western Front, Vancouver, BC. 2007 - Toque, Western Front, Vancouver, BC. Curated by: Emile O'Brien. 2005 - Front & Back: A Cornucopia, Access Artist Run Centre, Vancouver. 2006 - MFA, Concordia University, Montreal, Quebec. 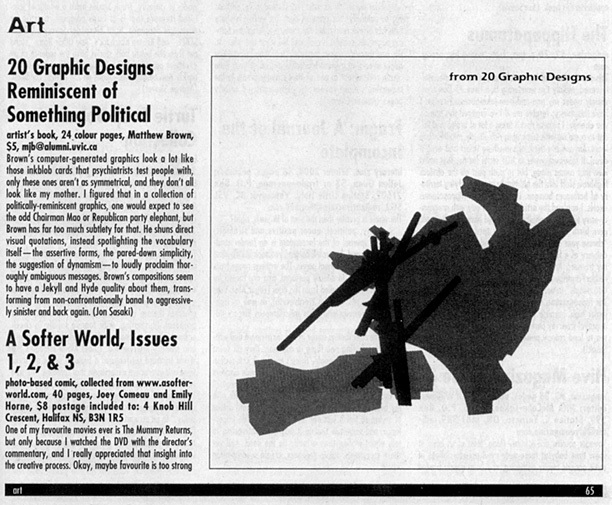 1998 - BFA, University Of Victoria, Victoria, Canada. 2004 - Senior Scholarship Award, BC Arts Council, Concordia University. 1997 - President’s Scholarship, Held At The University Of Victoria. 1997 - The Helen Pitt Fund For Fine Arts, Held At The University Of Victoria.